I was checking in on my Facebook group this afternoon and was asked the question: How do I sell my crochet patterns? I have an online shop, but I don’t even know how to list patterns on Etsy. Can you help? I figured that the writer probably isn’t the only person wondering how to list a digital item for sale on Etsy. Honestly, it’s not that hard and not all that different from listing a physical item. Add up to 10 photos of the product made with your crochet pattern by clicking “Add a Photo” and navigating to your computer’s folder where you’ve stored the images. You can batch upload the photos and arrange then once they have loaded. Edit the thumbnail photo to get it center the way you’d like. Add a keyword rich title. Be sure to include “crochet pattern” in the title. Select the appropriate drop-down options for “About this Listing.” Be sure to select “a supply or tool to make things” under the “What is it?” option. Select the appropriate Occasion and Holiday types where appropriate. Select the radio button for Automatic or Manual renewal based on your preference. Select the “Digital” option under Type. Add a keyword rich description, being sure to mention that it is a digital download. Add any other details that customers would need to make the decision whether or not to purchase your pattern. Unclick the Custom Orders checkbox. Under Section, select from the drop-down menu your shop section for crochet patterns. If you don’t have a section, add one now. Use all 13 tags to describe your pattern and the finished product. Be sure to use some long-tail keywords that you, also, used in the title. Under Materials, simply add PDF Downloadable Crochet Pattern. Add the price you’ll be charging for the pattern. Depending on your location, select the sales tax box as required. Select a quantity. I usually select 999 because that’s the highest you can select and I don’t want my pattern to show that it’s out of stock. I check on this periodically and add to the quantity as needed. Skip the SKU unless you use this option in your bookkeeping practices. Click on the +Upload File button to navigate to your computer’s folder. Click on the PDF of your pattern and it will be loaded into the listing. Now go all the way to the bottom right-hand corner of your screen and click on the black button that says PUBLISH. You will be instructed to click the button acknowledging that you will have to pay $.20 to list your pattern. Click that button and your pattern will post. Great! You’ve got your pattern listed. Now what?! Well, I’ve got you covered. I’ve put together a comprehensive checklist of every task on my pattern marketing to-do list and created a digital printable just for you. 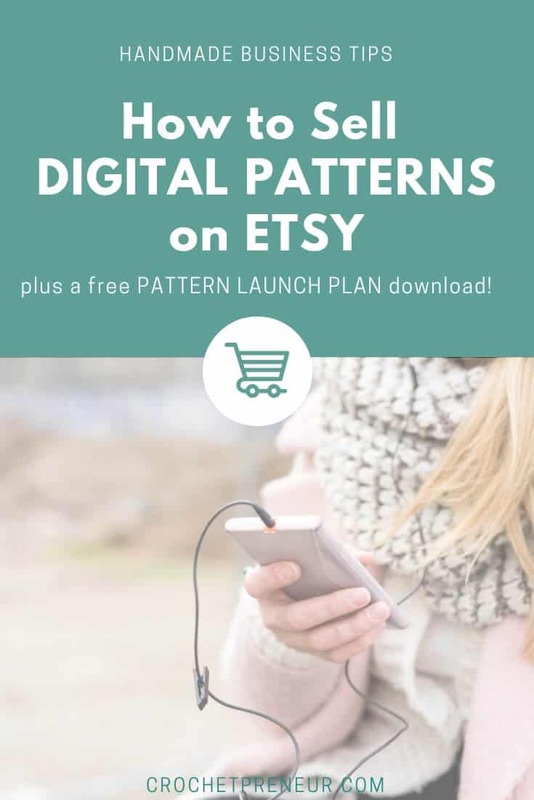 The Best Pattern Launch Plan Ever is a free PDF that you can download and print today to help spread the word about your awesome crochet pattern and it’s included in my FREE Business Resource LIbrary.